After nearly 300 years, one of the most important alchemical and magical texts of all time has finally been translated into English! In Goethe's immortal play, Faust, the brooding hero reflects upon the vainness of earthly knowledge and education. He opens a book of magic and is transfixed by an illustration of the magical universe. He resolves there and then to become a magician. The book that fired Goethe's imagination for that dramatic scene was a real book--the book of forbidden knowledge that evoked every mystical clich�--Opus Mago-Cabbalisticum et Theosophicum. 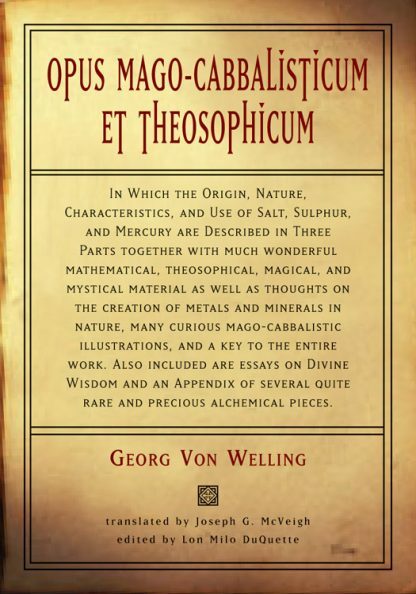 This first ever English edition of Opus Mago-Cabbalisticum et Theosophicum will appeal to anyone interested in the history or practical aspects of alchemy, astrology, magick, Rosicrucianism, esoteric Freemasonry, and the Golden Dawn. A perfect addition to any library of classic esoteric literature, this edition reproduces famous illustrations. Baptismal records in Germany indicate that Georg von Welling was born in or near the city of Kassel in the state of Hesse-Darmstadt in 1655. He worked as the director of the Baden-Durlacher Office of Building and Mines until 1723 and died in 1727 in Frankfurt. Von Welling was primarily known for his book Opus Mago-Cabbalisticum et Theosophicum, which influenced numerous subsequent authors and informed much of the tradition of Western Ritual Magick.